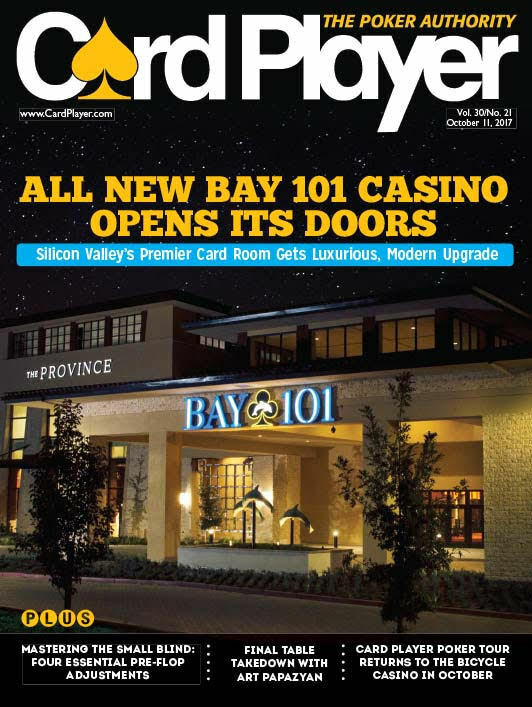 On Sept. 29, 2017, Bay 101, the popular Bay Area cardroom that has offered the very best in Silicon Valley gaming, food, and fun for 23 years, opened its spectacular new location. Designed with players and customers in mind, the new Bay 101 has a fresh new look with a classy, modern and distinctly Silicon Valley vibe, and is located just off the 101 freeway, less than a mile from the San Jose airport. With 49 high-action tables, open 24 hours a day, 7 days a week, 365 days a year, the poker room spreads a variety of no-limit hold’em, Omaha, and offers great tournaments. Bay 101 is perhaps best known for hosting the unique bounty World Poker Tour Bay 101 Shooting Star event, a tournament created by Bay 101 owner Marko Trapani back in 1997. If poker isn’t your thing, Bay 101 also offers a host of other games, including Pai Gow Poker, no Bust 21st century Blackjack, Three card Poker, Pai Gow Tiles, eZ Baccarat, and Ultimate Texas Hold’em. The new casino also offers customer deposit boxes, a full-service cashier cage, free Wi-Fi, cell phone charging stations, state-of-the-art security, ample parking, and nearly 40 HD big screen televisions. Check out Northern California’s premier card room today!